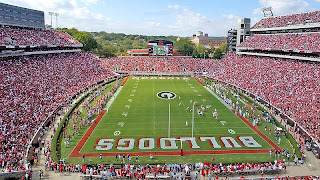 With the unified football viewing season splitting into basketball, gymnastics, baseball, and all sorts of other contests, I thought it might be useful to bring "Dawgs on TV" back. Here's the listings for the week ahead. Again, this is based on my DirecTV listings and I'm not going to go through all the CSS listings. -Kentucky v. Georgia - women's basketball replay - 12:00AM on Sunshine Sports Network - start your Saturday early by watching in dismay as a talented Georgia squad squanders a nine point second half lead to lose to a .500 team at home. Is there any variety of Georgia basketball worth watching? -Kentucky v. Georgia - men's basketball - 1:00 PM on CBS - Felton and the gang need this one. The Cats looked extraordinarily beatable early in the year, but it's hard to imagine a Georgia team who lost at South Carolina beating the Big Blue, even in Athens with a noted Kentucky-killer for a coach. -The Dennis Felton Show - 1:00 PM on SportSouth - Paul's new favorite show will no doubt breakdown the few bright spots of this week's basketball games. Replays: 7:30 PM and Monday at 6:30 PM. -The Suzanne Yoculan Gym Dog Show - 4:30 PM on SportSouth - Suzanne breaks down the big Alabama meet with assistant Jay Clark. This show is the best means of keeping up with the Gym Dogs, if you are so inclined, because the meets are televised only on tape delay weeks after they happen, if at all. Plus, the show is only 30 minutes, as opposed to two hours for a meet. Replay: Friday at 11:00 AM. -Georgia v. Florida - men's basketball - 3:00 PM on Lincoln Financial (check your local listings) - at least this year we won't hear the "just like football" chant. -Georgia v. Alabama - gymnastics - 4:00 PM on FOX Sports South & Sunshine Sports Network. "Is there any variety of Georgia basketball worth watching?" I get really pissed about the women's program, because if there's a team that underachieves more in the NCAA than ours, I'd dare someone to find it. Our team consistently loses the big games (see LSU or Tennessee any year, OU this year), and seems to be on the verge of starting to lose the small games too (UK?! Xavier!?). Landers is indisputably a good coach, but maybe he's more suited to helping develop talent at this point than game planning, because while we've got some great athletes, we have literally no plan while we're out there. I agree with both of you guys. The Lady Dogs seem like they are just happy getting to the Sweet 16 (Maybe Elite 8) each year and nothing more. I don't see that there is that much difference in our level of overall talent from say UT, UCONN, or UNC, so why can't we break through and make some noise in the SEC/NCAA tourneys? There is some tension going on with this year's team. Just read the quotes from last nights game. Hopefully things will look brighter soon. I can only assume that when SC yells "just like football", they mean "we win one out of six in basketball too". The Dennis Felton Show? Oh puhlease... stop it. I hate that show and he needs to be fired. We lost to South Carolina, not South Carolina State. In their last 3 games before UGA, SC won by 4 at 15-5 Arkansas, lost by 2 at home to 17-3 UF and lost to UK by 8at Rupp. So, how exactly does losing at SC make us not have much of a chance at home(where we are undefeated) vs a team that hasn't won a game on another team's home court all year? anonymous 8:14, if you were unfortunate enough to watch the South Carolina game, I think you would understand. It wasn't just losing. It was the fact that it was never even in doubt. Well, I just got back from the game and I can't wait to hear PWD's rant. There were flashes of good play but I feel like Georgia was really fortunate to only have lost by five. We outrebounded them 40-31 I believe but we shot less than 40% from the field and were probably much worse from three. As PWD has said countless times, there were stretches where we were content on dribbling around for 25-30 seconds doing nothing and then jacking up an ill advised shot. UK went out on a 10-0 run to start the 2nd half and we look clearly outschemed from the start of that half. However, felt waited until after an alley oop that made the lead eleven to call a TO. I was completely confused as to why he waited so long to call it because it was so obvious the momentum had shifted. Conversely, and to our credit, UGA came out with a run that cut the lead to 3 or 4 and Billy Gilespie IMMEDIATELY called a TO. I think this more supports the notion that PWD brought up last week with Felton's affinity to wait forever or not even use timeouts. With all that said, I really didn't expect us to win but I was happy with the close loss and a good game. Gaines had 4 fouls with 7 or so to play I think, but Zac Swansey stepped in beautifully while he was on the bench. All in all, I think UGA should be feeling very fortunate to having lost by only 5. Bradley was out with an injury midway through the first half and Patterson (UK) should have gotten the ball ALOT more than he did (a few nasty alley oops on UK's part throughout the game). Another thing I kept thinking during the game was this: does Terrence Woodbury look worse than he has the past two seasons? He made some boneheaded mistakes today and has not shot the ball as well in my opinion this year compared to recent seasons. I apologize for the length but like PWD has said, I keep seeing the same ol' same ol' and it's getting annoying. The Dawgs on TV guide is quite useful. Thanks, and keep it up. Can we please fire felton already!! Have never been a Felton basher, but I really do believe it is time for this program to make a change at the end of this season barring a miraculous turn around. I keep seeing the same ol' same ol' and it's getting annoying. OK, so when do we start to make a change? Felton isn't even playing .500 ball after five years. Our football program is in good shape, perhaps it's time to start working on the basketball program. Short shots are easier to make than long shots. I know it is quite profound. Our men's team has yet to figure this one out.